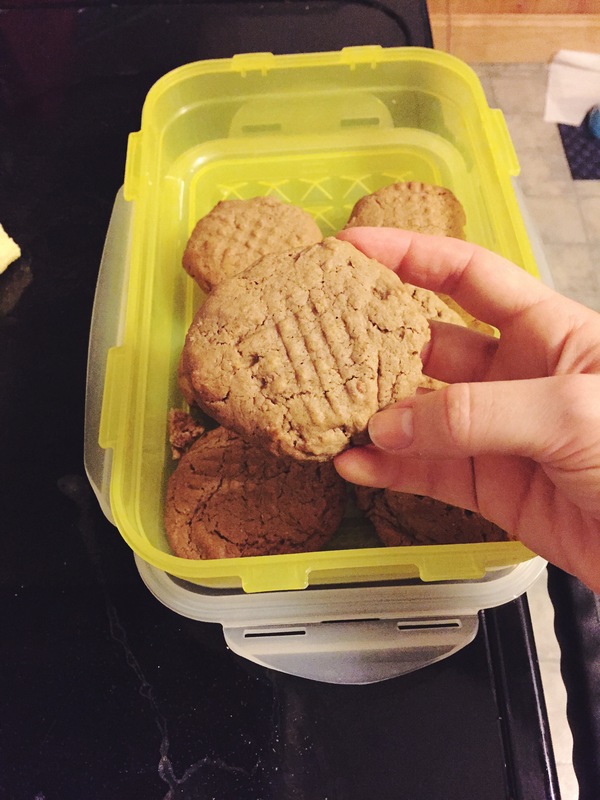 Have you ever gotten an intense craving for peanut butter cookies in the middle of the night for no reason? Me too, I feel you. But sometimes, all you have is the fancy-pants freshly-ground peanut butter, so it seems a shame to use it in cookies. But sometimes, you have a jar of homemade almond butter that you processed with coconut oil and cocoa powder just sitting in the fridge waiting to be used! So, obviously, cookies must be made! I was lucky enough to receive a pink KitchenAid stand mixer at my bridal shower last month, and these cookies were just the thing to christen it. I love that homemade cookies always look a little bit wonky. Preheat the oven to 375. Line 2 cookie sheets with parchment paper. I use these! In a stand mixer with the whisk attachment (or in a bowl with a fork if you’re a normal person), cream together the coconut oil, almond butter, brown sugar, almond milk, and vanilla extract until just combined. Slowly add in the rest of the ingredients and mix until just combined. Scoop out the batter onto the parchment paper a tablespoon at a time. It will be very gooey, but the coconut oil will keep it from sticking. Once the cookie sheets are full, use a fork to make a crosshatched impression on the top of the cookies, because s’cute. Bake for 8-10 minutes, rotating the trays halfway through cooking. I like to swap oven shelves at this time to make sure both trays cook evenly. At (approximately) the 10-minute mark, remove the cookie sheets from the oven and let your cookies cool on a rack. They’ll still be a bit gooey, but don’t overcook them or they’ll turn to rocks. Gooey is good. Gooey means they’ll firm up to the perfect texture. Have you heard? Almond butter is the single easiest freaking thing on planet earth to make. It is the pet cat of foods—it requires minimal effort and doesn’t need any attention paid to it. Put all the ingredients in a food processor and process on high for 20 minutes, scraping the sides intermittently if you need to. That’s it. The end result is a luscious, creamy heaven-sauce that tastes amazing on waffles, in yogurt, and in smoothies. Enjoy these amazing (and healthy!) cookies this week!